If somebody called you a racist or a sexist, you'd probably get defensive. We know it's not okay to be perceived as those things and we feel ashamed when our actions are perceived as contributing to those systems. But if I called you an ableist would you have the same level of defensiveness? My guess is that you'd have no idea what I was even talking about. Ableism is discrimination or prejudice against people with disabilities. It's often characterized by a belief that people with disabilities are "inferior", that their minds and bodies are a "broken" version of normal, and that they are unable to fully participate in society. Ableism is pervasive in our culture and very few people seem to be aware of it or willing to do anything about it. But we can (and should!) change that. Like most of the "isms", ableism can be intentional or unintentional. It can mean not hiring the person with the disability because they are perceived to be "less capable". It can be the denial of access to spaces and experiences that able bodied people have ready access to. It can be failing to recognize the ways in which our systems deny people with disabilities access, or the opposite...underestimating their abilities. It plays out a million different ways every single day and keeps people with disabilities from being able to fully participate in society. I recently attended a meeting at a local organization. It was on the basement level of a building that did not have an elevator. What if I was unable to navigate stairs? Would I have been excluded from participating? Would they have moved the meeting? Would I have even felt comfortable asking for the accommodation? Did anyone planning the meeting stop to think "is this accessible to everyone"? I am picking on this one organization, but this happens all the time. Events are planned without consideration for whether they are accessible to folks with disabilities- physical, mental, or otherwise. Those of us who do not have disabilities take for granted these challenges because we don't have to think about them. It's sort of like white people being unaware of their racial privilege. We often don't realize how our whiteness opens particular doors for us or what unique challenges people of color deal with in navigating the world. The same could be said for "able" people. We often fail to recognize how the world caters to "able" people or consider the unique challenges those with disabilities face. The good news is, we can do something about it. Pay attention to how you think about and interact with people with disabilities. Do you treat them differently than you do "typical" people? Why? Sometimes it's appropriate but sometimes it isn't. Be mindful about those interactions. Think about the language you use. Do you say things like "I don't know how you do it" to people raising kids with disabilities? Don't...especially in front of the kids. It sounds like you are saying our kids are a burden that you couldn't imagine dealing with. My son isn't broken and I don't "deal" with him. He lights up my world. It's not okay to speak as if somebody else's life is insufferable. Check your assumption that people want to be "typical". For plenty of people with disabilities, their disability is part of their identity and they can't imagine life any other way. Just because they have a a disability doesn't necessarily mean they long to be "healed" or that they spend a significant amount of time wishing their life was different. It's quite possible they are fulfilled and content with their life just as it is. 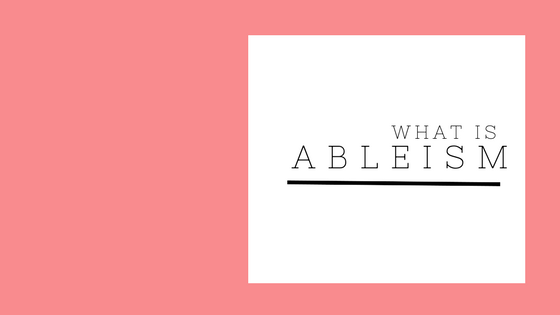 What are some ways you are perpetuating ableism and how can you shift you thinking, words, and actions to be more inclusive?